They are a substance class known for about 20 years and come from a liana from the African jungle. 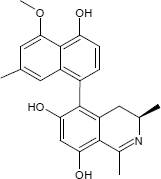 A member of this Ancistrolikokine called natural product class is currently attracting attention: The variant E3 shown above is a promising drug candidate in the fight against certain forms of pancreatic carcinoma. The IUPAC has updated the standard atomic weights of 14 chemical elements. The atomic weights of aluminum, cobalt, gold, holmium, manganese, niobium, praseodymium, protactinium, rhodium, terbium, thulium and yttrium have been revised. 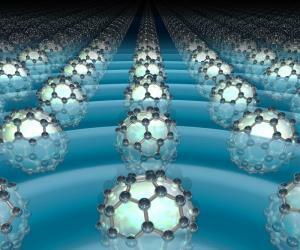 Usually, the movement of electrons in a real material is rather different from the flow of water in a river. However, in extraordinary materials like the metal oxide palladium cobaltate, "electron rivers" can exist, as predicted theoretically over fifty years ago and now demonstrated by scientists from the MPI CPfS [Image credit: MPI CPfS]. 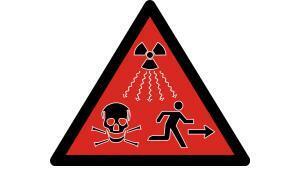 What exactly are the processes when x-ray photons damage biomolecules with a metal centre? Scientists from the Max Planck Institute of Biochemistry report on the decryption of a cellular mechanism that explains the formation of protein aggregates. Figure: Mistakes in the blueprint for proteins (mRNA) lead to the production of useless proteins in the ribosomes. 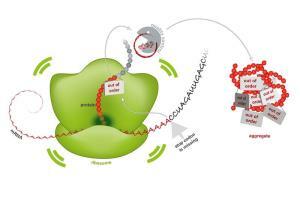 Since the quality control is broken, these proteins accumulate and form toxic aggregates. Screening truffles for radioactivity 30 years from Chernobyl. 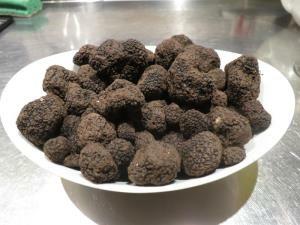 Image: Burgundy truffles ready for analysis. Scientists have analysed Burgundy truffles collected in central Europe and found they contain only negligible amounts of radioactive caesium, being safe for consumption. 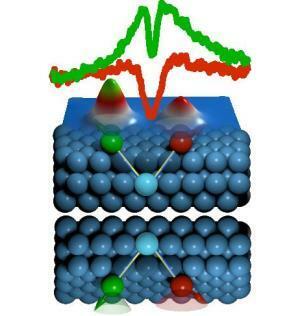 The Figure shows a pair of magnetic iron atoms on top of a platinum crystal surface as 'seen' with a scanning tunneling microscope. The spectra of the left and right atom, taken with the same microscope, show characteristic gaps, that tell the scientists a clockwise rotation of the atoms' magnetization exists, as illustrated by the clockwise rotation of the arrows from the green to the red sphere representing the iron atoms. The reason for this right-handedness is a peculiar magnetic handshake mediated by the platinum atoms in the substrate below the iron pair which breaks the mirror symmetry, as apparent from the mirror image on the bottom. Figure: Illustration of the various processes that take place during Sisyphus cooling of polar molecules [Graphic: MPQ, Quantum Dynamics Division]. Image: Intense laser flashes remove the electrical resistance of the alkali fulleride K3C60. This is observed at temperatures at least as high as minus 170 degrees Celsius. Figure - Basic concept of the experiment: MgH+ (orange) and Mg+ (green) are trapped together in a linear ion trap. The two-ion compound is cooled to the motional ground state via the atomic ion. An oscillating dipole force changes the motional state according to the rotational state of the molecular ion. 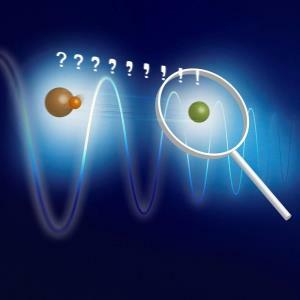 This motional excitation can be detected on the atomic ion. A New Study shows Correlation between Microscopic Structures and Macroscopic Properties - and offers a Recipe Book for Colloids. 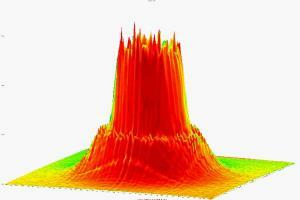 Image: Using neutron scattering, researchers were able to study the structure of their samples. The size of the rings in the image can, for example, define the distance between two colloid particles. Boroles could be a highly interesting class of materials for practical use in photovoltaic or LED applications - if it weren't for the molecules' extreme instability. 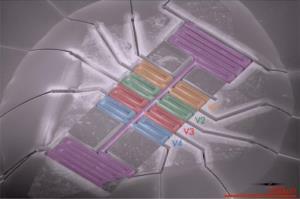 Chemists from Wurzburg have now discovered a powerful stabiliser. 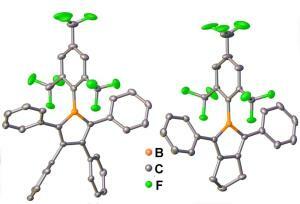 Image: Fluoromesityl groups boost the stability of boroles. F stands for fluorine, B for boron and C for carbon. Last update: 11 December 2018.